and all of our European adventures that follow. One of the advantages of working with a lot of Expats, is that everyone is always eager to organize a party or activity. Most people are away from home, and they don’t have families or friends nearby, so it is fun to hang out with each other. This is how we landed tickets to the Netherlands vs. Iceland football game (a.k.a. soccer for us Americans). About 15-20 people from Maersk (Simo, Marianna, Saif, Rusa, Perry, etc) got tickets to the game. We met up at Cabrinus (the "office" pub) for a couple drinks before the game, then hopped on the tram to go to Feynord Stadium, home to Rotterdam's local football team. 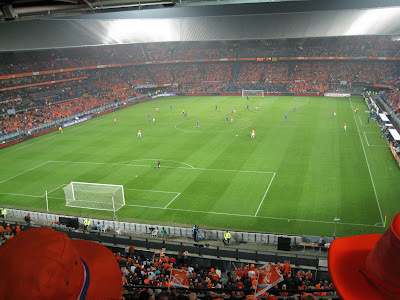 We wore our orange shirts and orange Holland scarves that someone had given us at a pub during the Euro Cup that summer. It was very funny riding the tram to the game because everyone had crazy orange hats on, their faces were painted, and people would spontaneously burst into a chant or team song. We had a really good time at the game. It was nice to be in that sort of atmosphere again, since we weren't able to go to any American Football games this year. :( But, I liked seeing everyone get excited for their team, and cheer when they scored. People took their game programs and tore them up into tiny pieces, and when their team scored, they would throw the paper in the air like confetti. They also had some chants/songs that the whole stadium would start singing. The Netherlands won the game 2-0. It was good to go to a game with other people who knew where they were going. Now, if we go again, we'll at least have a slight idea about what is going on. Hopefully we get to see another game while we are here.